Hi all, today i m going to be talking about something a bit technical…I hope you find it useful. I am an x-Yahoo and i was a mobile specialist and i thought that this post might be useful for some of you. Sometimes you could be testing a mobile page and you can’t debug or trace the errors rendering in the front-end interface. Using a testing device in that case might be unhelpful as you don’t have any tracing or debugging tools like “#firebug” (however you may be able to install it on your iphone or ipad with a certain tweak). So the best practice i found for that is to use a #user_agent to render the page in your browser as a mobile device. 1- Using the #iOS #simulator app installed in your #mac. If you can’t find it in your apps list; you should find it into the xcode packages files and you can simply keep it in your dock for future reference. The iphone simulator is a very useful tool in mobile testing but you will still not have the advantage of debugging an interface error or a broking CSS or an HTML line of code. 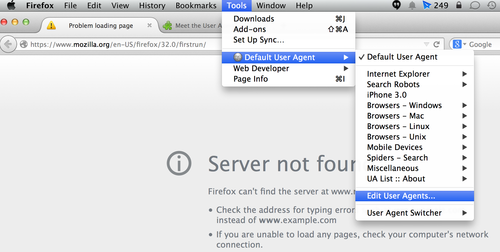 2- Install user agent switcher add-on to your #firefox browser. You’ll find a default list of extra browsers and devices to be used in testing. This XML files will append dozens of devices and browsers agents to your add-on and will make you able to test and debug your mobile page on many platforms.